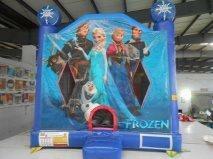 Disney Frozen Themed Bounce House has arrived! (((((I can't believe it))))) Book this spectacular bounce house rental now!!!! Help Anna make her way up the mountain on her epic journey to find her sister Elsa. The Beauty of Queen Elsa and Princess Anna are sure a draw a smile with this fun Disney Movie Inspired Frozen Themed Bounce House. Play with all your friends Anna, Elsa, Olaf, Kristoff, and Steve. Everyone wants the Disney Frozen Bouncer for their party!!!! !